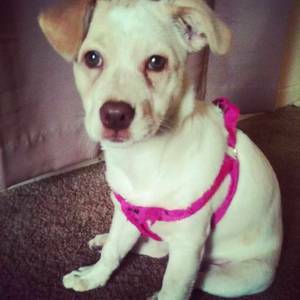 This is a picture of my Jack Russell Terrier/Chihuahua mix puppy named Nala. She is really smart and energetic. She is the size of a regular Jack Russell, but has long hair and a curly tail like a Chihuahua. She is quite the little athlete too! This picture is of Nala in her first harness. She is about 5 months old in this picture. I'm speechless, that's how cute she is. What a great mix of both breeds!